With the presence of a large pool of participants, the global artificial organ bank market is displaying a highly competitive business landscape, finds a new research report by Zion Market Research (ZMR). Boston Scientific Corporation, Medtronic Inc., Berlin Heart GmbH, and Asahi Kasei Kuraray Medical Co. Ltd. are some of the key vendors of artificial organ bank across the world. These players are focusing aggressively on innovation, as well as on including advanced technologies in their existing products. 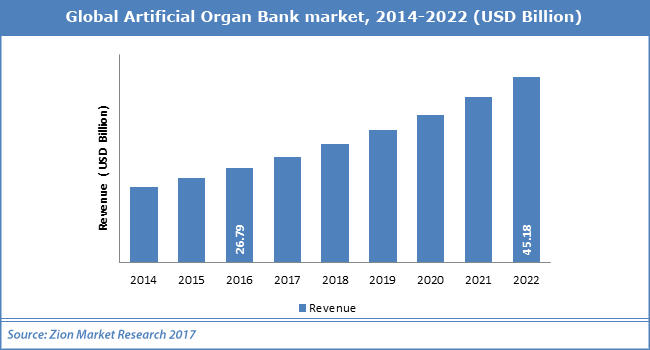 Over the coming years, they are also expected to take up partnerships and mergers and acquisitions as their key strategy for business development, states the artificial organ bank market study. In a major breakthrough that can prove beneficial for artificial organ bank market, in March 2018, MIT researchers created body-on-a-chip equipment, a microfluidic device that can store nearly 10 artificial ‘human’ organs including liver, gut, skin, lung, endometrium, pancreas, skeletal muscle, brain, kidney, and heart at a time. As estimated in this report, the global artificial organ bank market stood at US$ 26.79 billion in 2016. Witnessing a tremendous rise during the period from 2017 to 2022, the revenue in this market is expected to reach US$ 45.18 billion by the end of the forecast period. The main products available in this artificial organ bank market are artificial organ and bionics. Among them, the demand for artificial organ is relatively higher and the trend is anticipated to remain so over the next few years, notes the research report. “Rise in elderly population prone to organ failure along with increase in rates of renal failures & disorders as a result of excess consumption of alcohol will spur artificial organ bank market size in the years ahead,” claims the author of the artificial organ bank market study. Apart from this, rise in the frequency of collisions and huge demand for artificial organ transplantation is estimated to expatiate the artificial organ bank market growth in the ensuing years. In addition, growing health awareness among the people is anticipated to provide artificial organ bank market with numerous growth opportunities in the near future. Escalating prices of artificial organs, however, will restrict the evolution of artificial organ bank market over the years to come. Nevertheless, firms are making tremendous efforts to manufacture artificial organs or bionics at affordable prices through the use of new technologies, thereby trying to normalize the impact of hindrances on the artificial organ bank market, reports the study. Regionally, North America has been leading the worldwide artificial organ bank market and is anticipated to continue on the dominant position in the years to come, states the artificial organ bank market study. Huge funding of healthcare activities by the government along with massive investments in R&D sector is the main factor behind the dominance of the North America artificial organ bank market. Introduction of new technologies in bionics as well as artificial organ transplantation across the region along with a large patient population base is another significant factor that is supporting the growth of artificial organ bank market in North America.